Buy this Essiac Tea at RM 95.00 (20% off retail) when you become a member of NewLife International. Dr. Brusch’s Essiac-T, an 8-Herb Formula Tea Blend, is the result of the research by Dr. Brusch and Rene Caisse in affecting the original formula or made famous by Rene Caisse. 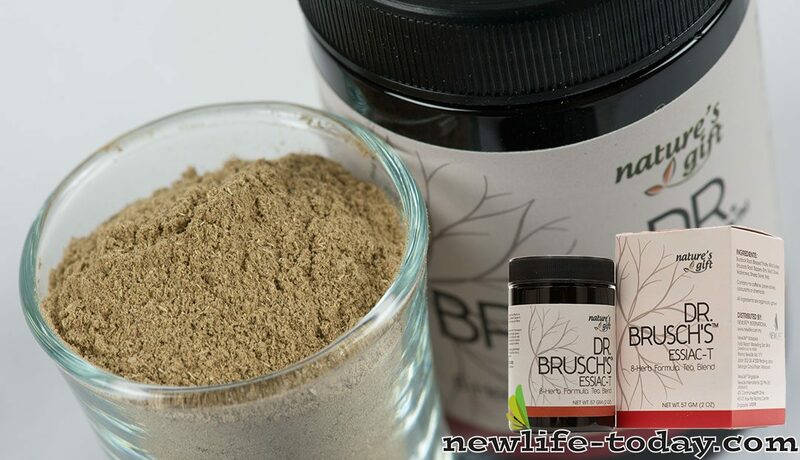 This dry herbal tea blend is in powdered form, the exact form used by Dr. Brusch. All herbs are organically grown; they are sourced from the same farms as Dr. Brusch did. Each farm has the laboratory on the premises to check for both bacteria as well as airborne residual matter. The audacity of the formula is personality guaranteed by Dr. Lynn Tan, a Doctor in Naturopathy, and a health crusader South East Asia. Contains no caffeine, preservatives, colourants or chemicals. All ingredients are organically grown. Please see instruction leaflet inside this box. Essiac Tea is actually a tea that’s made up of different herbs which is believed to have anti- carcinogenic properties. Dr. Brusch Tea (or better known as Essiac Tea) the original 8-herb formula tea blend, is the result of the research Dr. Brusch and Rene Caisse in perfecting the original formula made famous by Rene Caisse. Many doctors around the world are using this tea for building of immunity and curing of cancer. Dr. Brusch Essaic Tea works on the glands of the body, improving digestion and detoxifying the liver. This is as good and explanation as any as to why people feel good is such a short time after using it. It reduces the toxicity in our bodies from our present environment and balances food supply. People who consumes it daily are reputed not to get colds. Some people have started taking it when they have not been expected to live more than a few weeks and are not just alive today, but feeling positive about living and are now gaining strength. Improves the well-being and enhances moods. An excellent blood and liver purifier. Soothes body irritation both internally & externally. Burdock root is often a mild diuretic. It increases the production of urine and sweat, potentially creating it valuable in treating swelling and fever. Stated to be rich in vitamins, minerals, and that it’s also cleansing towards the liver, lungs and kidneys. Burdock Root is wealthy in vitamins B-complex and E. Its trace minerals involve potassium, phosphorous, chromium, cobalt, iron, magnesium, silicon, zinc and sodium. Blessed thistle is utilized for digestive complications for example gas, constipation, and upset stomach. It is a natural antibiotic that might be beneficial fighting some kinds of infections in the body. Slippery elm is a superb help for assistance of the mucous linings. It truly is a tree where its bark is medicinal. Slippery Elm is often a deciduous tree which can be discovered in Central and Northern America. Slippery elm is often a key ingredient in Essiac tea that is probably the most well-known herbal cancer options in North America. A staple of herbal blood cleansing formulas and has a lengthy history of use as a medicinal herb. Red clover is a superb blood purifier that over time gradually cleanses the bloodstream and corrects deficiencies inside the circulatory method. High in Vitamin C, watercress is made use of as a general tonic, and its bitter taste is believed to regulate the appetite and increase digestion. Sheep sorrel can be a rich source of oxalic acid, sodium, potassium, iron, manganese, phosphorus, beta carotene, and vitamin C. This essiac tea ingredient is a mild diuretic, mild antiseptic, and also a mild laxative. A healthy thyroid can support metabolism and hormone fluctuations. Kelp is really a source of iodine which is critical inside the production of thyroid hormones. Kelp is actually a sea vegetable that’s a concentrated source of minerals, including: iodine, potassium, magnesium, calcium, and iron. Recognized as a primarily potent herb, Indian rhubarb root is traditionally used as a gentle laxative that assists purge the liver of toxic buildup and waste.